Radar type CPS-6B is a ground based radar for early warning CGI usage. By virtue of its "Vee" beam operation this equipment will be capable of supplying range, azimuth and elevation information. Because of its instantaneous presentation of height information, without the use of separate height finder radars, type CPS-6B radar are particularly useful in areas in which higher traffic may be anticipated. Improved low noise figure receiver. Addition of Moving Target Indicator (MTI). Improved presentation plus video mapping. Combined D/F indicator for radar PPI. Contracts have been let to Canadian General Electric for production of quantity two CPS-6B equipments to US Specification amended as regards display presentation. First delivery from contract is expected approximately May 1950. Estimated cost $2,400,000 per equipment plus installation cost. Elevation Resolution None, (V Beam); Elevation Accuracy +/- 500 feet relative. The CPS-6B employs two fan beams at an angle of 45 degrees to each other. In scanning, the delay between successive incidence of the beams on the target depends on its height and slant range - this fact is used in height determination. The vertical beam above is used for search. Azimuth 360 degrees at rotation rates between 2 and 15 rpm. Elevation - fixed determination without scan. The AN/CPS-6 was developed during the later stages of World War II by the Radiation Laboratory at MIT. The first units were produced in mid-1945. General Electric developed and produced the A-model and subsequent B-model at a plant in Syracuse, New York. The unit consisted of two antennas. One of the antennas slanted at a forty-five degree angle to provide the height-finder capability. Initially, the radar was designed to detect fighter aircraft at 100 miles and 16,000 feet. The radar used five transmitters that operated at S-band frequencies ranging from 2700 to 3019 MHz. It took twenty-five people to operate the radar. 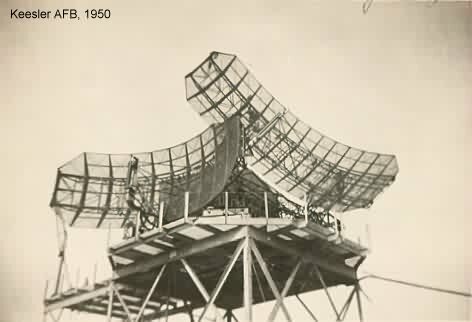 An AN/CPS-6 radar was installed as part of the Lashup system at Twin Lights, New Jersey, in 1949 and proved capable of detecting targets at ranges of eighty-four miles. 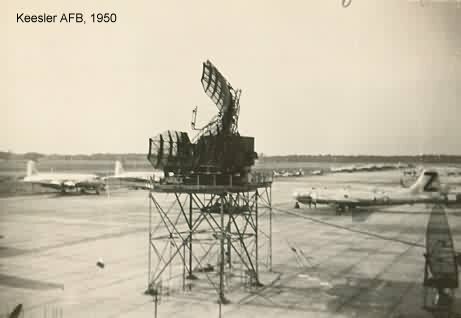 The first units of the follow-on 6B radar set were ready for installation by mid-1950. Fourteen 6B units were used within the first permanent network. A component designed to improve the radar's range was added in 1954. Initial tests showed the 6B unit had a range of 165 miles with an altitude limit of 45,000 feet. One radar unit and its ancillary electronic equipment had to be transported in eighty-five freight cars. The US Air Force phased out the 6B model between mid-1957 and mid-1959. The CPS-6, 6A and 6B radar system was a combined search and height finder system. 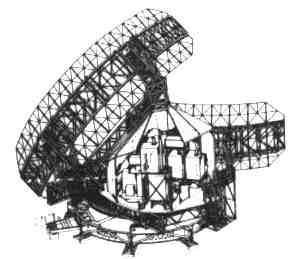 This equipment operated in the S Band and was developed by MIT Radar Laboratories. It was never used in SAGE operations. 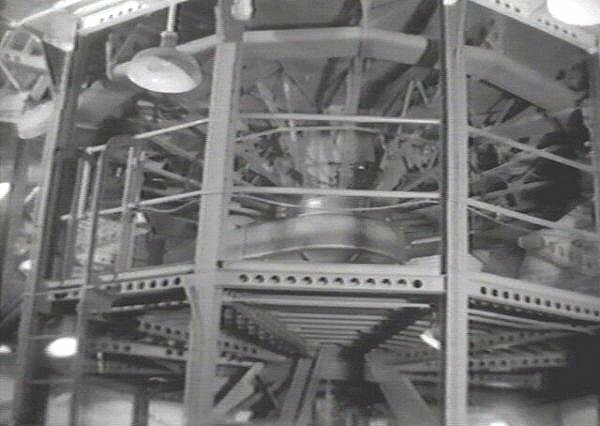 Gear assembly for the CPS-6B search radar antenna in Lac St. Denis, Quebec - 1953. Courtesy of the movie "Radar Station". 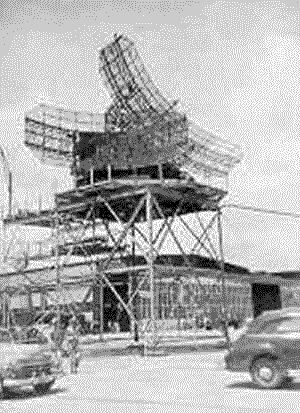 AN/CPS-6 search radar antenna at Keesler AFB - 1950.